After only a few months in Canada at a girl's boarding school, Flavia de Luce is on a ship bound to England, her home, Buckshaw, and the village of Bishop's Lacey. Accompanying her is Mrs. Bannerman, an acquitted murderess, who was also Flavia's Chemistry Mistress. The two have formed a firm friendship. Flavia will need that friendship before the end of the novel. Upon her arrival at Buckshaw Flavia learns that her father is in the hospital, gravely ill with pneumonia. Indeed, he is so ill that neither she nor any of her family is allowed to visit. Therefore Flavia is more than happy to visit an elderly woodcarver, on the request of the Vicar's wife. It being Flavia, however, when she arrives she finds the body of the woodcarver, murdered in a particularly gruesome manner. After forming her own conclusions, Flavia determined to unmask the guilty party. All of the people we have grown to love (or at least tolerate) are present in the novel, the loyal Dogger, Mrs. Mullet, and Flavia's obnoxious sisters, Daffy and Feely. Added to the mix is her cousin, an exceedingly odd little girl. The household is so distraught by her father's illness that Flavia is able to fly around the countryside on her beloved bike, "Gladys", with no one paying any attention. Flavia has always been somewhat neglected by the family, but not even Dogger is paying her much mind this time. She can at least call on Mrs. Bannerman's help in her investigation and it is gladly given. I only discovered the Flavia De Luce novels this year and read them in rapid succession. Flavia is a unique voice in fiction, truly one of a kind. She is intelligent, enterprising, strong-minded and, now that she is growing up, developing an adult empathy that makes her even more attractive. However, I was shocked somewhat and saddened by the book's ending. After reading the seven previous books the wait for the next seems very long. Thanks to Delacorte Press and NetGalley for an advance digital copy in return for an honest review. 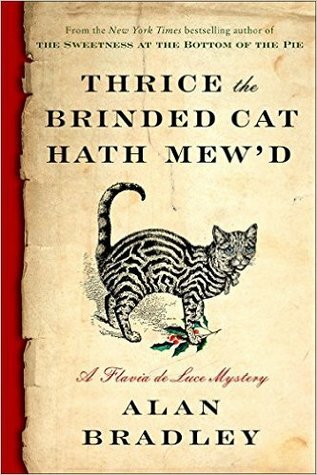 I highly recommend Thrice the Brinded Cat Hath Mew'd, with a further recommendation to start the series at the beginning with The Sweetness at the Bottom of the Pie.